Working on behalf of a group of investors, John Robinson, product development consultant at Dynamic Input, approached Nik Richardson at Open Life Packaging Limited (OLPL) eight years ago to work on an exciting project – a new time temperature indicator (TTI) system called Oli-Tec (Open Life Indicator Technology). The idea of producing a new type of self adhesive label with universally understandable product life cycle indicators – green/‘good’, amber/‘consume now, I’m about to go off’ and red/‘do not use’ – was originally conceived by Alex McLennan. He convinced the InTray investment group to take up his idea and they in turn employed Robinson. An agreement was finalized five years ago, enabling OLPL, Intray and Mark Andy to begin designing and developing the machine. Manufactured at Mark Andy’s headquarters in St Louis, USA, and building patented technology onto a Mark Andy 2200 base, the Alpha machine for pilot production is now finished and in the process of being fine tuned. County Labels (see boxout) has created a clean space for it at its facility in Macclesfield, UK, but it could possibly be located close to the Mark Andy USA facility. Richardson predicts the Beta model could be up to ten times faster than the current system and expects there will be a label to show the market by September. The Oli-Tec label is a multi-layer construction. The base layer comprises multiple ‘reservoirs’, each containing different fluids. The middle layer contains multiple ‘conduits’ – or capillaries – of differing lengths filled with High Viscosity Media (HVM), which connect into the reservoirs below to allow the fluids to react with each other. The top layer acts as the ‘start mechanism’ for the label when partially, or peelably, removed – at the point of packaging for fresh produce or the point of opening for pre-processed goods. It also has surface decoration and a viewing window. The label is designed so that any internal failure – for example due to external trauma – triggers a ‘fail safe’ mechanism, resulting in a red indicator. ‘The science behind the label is proven and accurate,’ says Richardson, ‘It is a true TTI, working with velocity and enzymes. There is no ambiguity about if a product has gone off, as the color change happens within a 40 second period’. 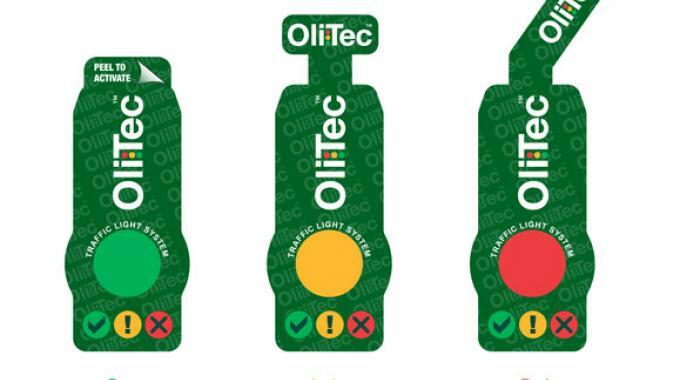 Label designers looking to incorporate Oli-Tec will need to be aware that currently the label shape and size is limited by the length of the capillaries required to measure the product’s life cycle. The construction means the label is relatively thick, with up to six layers of film – all made, incidentally from recyclable, non-toxic material. The material remains flexible and can be applied on traditional PS applicators. ‘In fact the thickness of the label aids application,’ says Richardson. Current systems used to measure food freshness – ‘best before’, ‘display until’, ‘use by’ and ‘use within’ are simply storage guides. In contrast, Richardson says the internal timing technology used in Oli-Tec adapts to temperature changes, better protecting the consumer. Suitable for food, pharmaceutical and cosmetic applications, Oli-Tec can be designed for a specific product and temperature – for example omitting the amber stage for pharma and making the label change on seven to 10 days as opposed to 10 to 14 days at a set desired temperature. Similarly with products such as spices, which, kept past their best, can damage a brand’s reputation as the quality and taste deteriorate. Because Oli-Tec is activated only at the packing stage for fresh foods, retailers can give much more accurate use by dates compared to the current system, reducing the cost of thrown away, but still edible produce. Retailers could discount produce with amber labels while red would highlight the last day of sale with a final discount. Richardson also believes Oli-Tec could aid brand loyalty as consumers actively seek out these products with this technology. OLPL is currently working on validating its technology in cooperation with the FDA, the UK’s department of food and rural affairs (Defra) and various specialist laboratories. It is also looking for end users to pioneer the technology in return for an exclusivity period. The Oli-Tec technology will be licensed out by Open Life Packaging, which owns the production rights to Oli-Tec while investment group Intray owns the patent rights. The licence allows the purchase of the dedicated machine which produces and converts the Oli-Tec label. The machine itself is complex to operate, so OLPL plans to open a dedicated training centre for press operators. Based in Macclesfield, UK, County Labels is a growing business. It was founded in 1987 by Nik Richardson, at the age of 21, with just a hot foil machine in an old barn at his parents’ farm. The current 22,000sq ft plant is located in an old mill building and still specializes in hot foil and flexo printing, using Mark Andy 6- and 8-color machines. Other specialist work includes high end holographic security labels. In the last three or four years it has begun converting plain labels, a sector of the business which is growing significantly. Celebrating 25 years in business this year, County Labels has 28 employees and a four million pound turnover. For further information contact Nik@Openlifepackaging.com. The website www.openlifepackaging.com will be online by the end of August 2012.